Wow, I thoroughly enjoyed this book, even more than I was expecting to. Being a Young Adult mystery novel about 5 young scientists I was sure it had some merits but what I loved the most about the book were the characters. 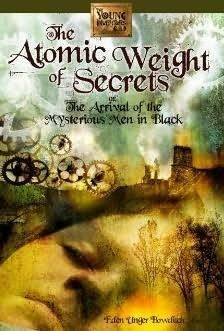 In Atomic Weight of Secrets we have 5 smart, intelligent yet sweet and vulnerable kids from different parts of the world. They have all been mysteriously abandoned by their scientist parents and have been taken to a farm in Dayton, Ohio by some weird and funny looking men dressed in black. We have Lucy and Jasper, a brother and sister duo; Lucy is the most charming and lovable of the lot. She is only 6 years old, naive and cute but also wise in her own way. Jasper is the caring older brother who takes care of Lucy and comforts her from time to time. Faye is an Indian who is very rich and spoilt. Wallace and Noah are also kids who are from well to-do families but have problems of their own. As they get to know each other, a bond is created between them as they realize each other’s strengths and weaknesses. Although the story gets bizarre at time, it will still keep you entertained. I was on the edge of my seat towards the end. I cannot wait to read what happens in the next book. It has something for everyone, kids will love reading about the adventure and the mysterious but over the top men in black, adults will also enjoy reading about young but intelligent kids. Give it to your kids or read it yourself, either way its a treat. This entry was posted in ARC/ Review copy, Books, Books read 2011, Reviews, Young Adult. Bookmark the permalink. This sounds like something I would like — but I’m also going to recommend it to my nephews. Sounds like a fun book, I love the cover! You have definitely sold this one to me. Now I have to get this. This sounds really good! I bet my daughter would like it.